What I wore to work.. although I would also wear this to a party/shower, church or out to a nice dinner. In case you haven't noticed I love color! Bright vibrant color just makes me happy :) I really like that the skirt mixes purples, blues and teals. It goes with multiple tops in my closet! Gray flats: Anne Klein iflex bam bam super comfy! For the 3rd day we had booked a King Ludwig (yes crazy King Ludwig II) castle tour through Gray Line Tours. So early the morning of May 27th we hopped on the subway one stop to where we met the tour bus in Munich. There are several tour companies that do a similar tour but this one seemed to have the best reviews and we liked the idea of the bus taking your to the places and getting your tour tickets with timeslots/meeting times for you whereas some other tours led you their via public transit or didn't arrange the entrance tickets. It was pretty chilly and raining while we were waiting to board the bus. Everyone standing there couldn't wait to get on the bus and I remember thinking that the castles wouldn't be as pretty or fun in the rain. When we boarded the bus a little after 8am there was a digital display of the outside temp and it said 6 degrees Celsius. We didn't know exactly what that correlated to but we knew 0 was 32 degree Fahrenheit. And now just looking it up it's 42.8 Fahrenheit. Definitely chilly! 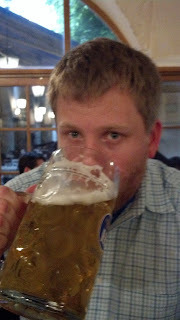 It was a 1 hour 15 min drive to the first castle, Linderhof Palace near Oberammergau. There was a gorgeous view of the Alps on the drive there and slowly the temperature was climbing so we were hopeful it wouldn't stay cold the whole day. It had stopped raining when we got there and we had a 10 minute walk to the palace. The tour guide was very knowledgeable and had great English (I believe she was British). There were no pictures allowed inside, sorry. She started off with some history about Ludwig and the castle. This was the only one of his castles finished in his lifetime. He lived there for 8 years. Then we went to various rooms that were part of the tour (the castle had more rooms than are part of the tour). There was one room that had gold fleck painted over everything it seemed. The symbol of the sun is everywhere throughout the palace. There was a hall of mirrors that he especially liked as he slept during the day and was awake at night and this room reflected the lights from candles a thousand times. His bedroom had a large royal blue velvet bed. And the most interesting room/item was the "dumb waiter" table in his dining room or as called by our guide, "the table that served itself". It was set below in the kitchen by his staff and then raised up to his dining room so he did not have to be disturbed, although they set it for 4 people because Ludwig had imaginary people he talked to while eating. Again, this is crazy King Ludwig. Right outside were lovely grounds and a garden area. On the way back to the bus we set up the tripod so I could take a few shots of the four of us. It was really just so beautiful. We departed Linderhof and arrived in the little town of Oberammergau 30 minutes later, at 11:15am. It was then that the first sunshine of our trip happened! It was getting warmer too so we no longer felt chilly. It has little shops and such and you can tell it mainly thrives on tourism. It is also famous for it's Passion Play, first performed in 1634 and then once every 10 years. Now it is performed in years ending with zero and on big anniversaries of the original play like 1984 (350th anniversary). We strolled around looking at a few shops and the outside of the theater where the passion play is performed and we had basically felt we spent more than enough time there. The bus then left to make the drive to the other Ludwig castle we would see that day, Neuschwanstein (it's one German word I mastered saying correctly mainly so I could talk about the castle). You could see it far in the distance on top of a mountain as the bus got close to the town. The BIG one. The one that you dreamed of as a little girl. THE DISNEY CASTLE. Disney literally modelled his castle after this one. So pumped so pumped (well at least Megan and I were... boys were probably napping)! The bus parked at the in a little town at the bottom of the hilltop that the mountain was on. It has several shops, restaurants and a hotel. We looked at a few menus and most seemed over-priced so we went to a little hot dog stand where the boys could get hot dogs and Megan and I had cheese, tomato and lettuce sandwiches. Then we started to make the trek up to where the castle was. This was a long and steep hike. I tried to show it in a photo but it was kinda hard to capture. Just trust me, this was no easy walk. They do have a trolley option but we felt up to walking. Thank goodness it was not cold and rainy or I might have felt different about a steep hike with slippery pavement. View down on the town. Once there it wasn't time for our tour yet and we wanted to find Mary's Bridge. There was a little construction going on around a walkway so it took us a bit to find it so we had to walk there pretty quickly and didn't have a lot of time there. It was fairly crowded with people too. But I was able to get some nice shots of the castle. Like I said, a fairy tale right? We booked it back to the castle where we were supposed to meet for our tour time. If you miss your tour time you do not get to go in (a big reason why we liked the organized bus trip). Again there were no photos inside. We had a guided tour here too but the guide's English wasn't quite as easy to understand as the last castle. This castle was obviously much bigger but a lot even though it was going to have 200 rooms only 15 of those were completed. It had a big throne hall, another hall and a huge chandeliers. The kitchen was seen after the tour on the way out of the castle so I was able to snap a quick picture. After the tour before the walk back down. 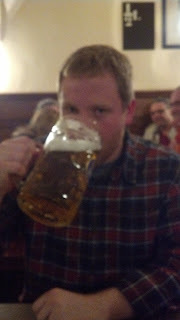 We walked back down to the bus which took us back to Munich and we arrive around 6:30pm so it was time for dinner. 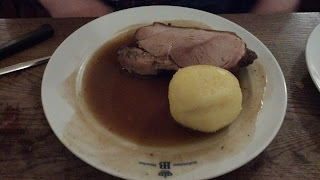 Eric had picked out a restaurant with Bavarian food known for their different kinds of meatballs, Zwickl near the market. Keith and I each got the traditional beef and pork meatballs with a potato and bean salad. The side sounded strange but it was delicious. 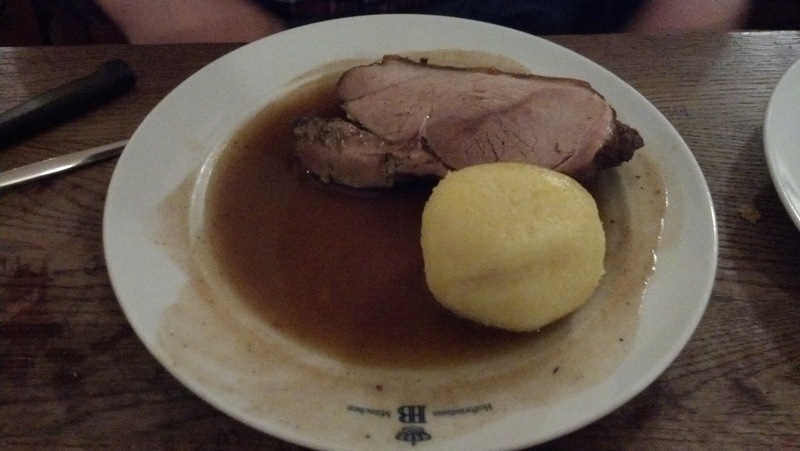 Eric had a lamb "meatball" dish with potatoes. And Megan had spinach and cheese non-meatballs with salad. They had these delicious pastes on every table to eat with the meatballs... a mustard based one, pesto based, and tomato based. We had a hard time deciding which one was the best. They were all yummy and nicely complimented the meatballs. 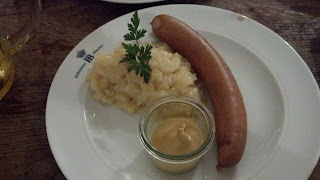 I think this was everyones' favorite meal in Munich (even though Italian the first night was awesome, this time we weren't jet lagged and could enjoy being out more). Reasonably priced and friendly English-speaking waitstaff too. I would definitely eat there again! 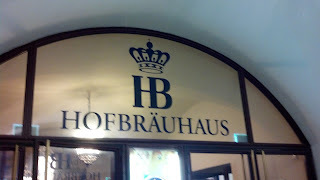 Go if you are ever in Munich! After dinner we went in search of dessert but couldn't find something open. We found that kind of odd... we didn't have such great luck with desserts in Munich. Thankfully we did not have that problem in the other cities! So we had a great tour of the castles, got to see the sun appear and had a fabulous dinner! Next up... travelling to Salzburg! This is one of my absolute favorite dishes to make in the summer. On a recent trip to the farmers market I made sure to pick up some heirloom tomatoes, fresh basil, and peeled garlic. Yes, garlic. My friend Katie got us hooked on the quart-sized bag they sell for about $2 filled with already peeled garlic cloves. It is great and also can be frozen for future use because who can use garlic THAT fast... although I bet Eric would make a valiant effort. Seed the tomatoes and dice. Drain in colander for 15 minutes. In medium bowl, combine the tomatoes, olive oil, balsamic vinegar and garlic. Season with salt, pepper and cayenne. Stir gently and let stand for about 20 minutes so flavors can develop. Stack and roll basil leaves to slice. Cut mozzarella into small cubes. Meanwhile bring a large pot of water to boil and salt the water. Add pasta and cook according to package directions. Drain pasta and transfer to large bowl. Add tomato mixture and stir. Add mozzarella and basil and stir gently. Add more spices if desired. Top with basil sprigs and serve immediately while warm. There is just something wonderful about the smell of fresh basil and tomatoes. Basil is definitely my favorite fresh herb. Enjoy! Today our journey continues in Muchen starting with a trip to Dachau Concentration Camp. Early the morning of May 26th we walked the few minutes to our subway stop and took the subway then the #726 bus to Dachau. You buy a XXL day pass to do this. It takes around 45 minutes to get there. It was colder than the day before and raining off and on but really that just added to the somber mood of the concentration camp. The first stop was the visitor center to pick up the audioguides for 3.50 Euro a piece. It was very informative and allowed you to pick a shorter or longer version of exhibits. Although not as well known as Auschwitz, Dachau was the first Nazi concentration camp and was where those running all the other camps were trained. It started as housing political prisoners and later become a departure point for those shipped east to the gas chambers and a center for medical experimentation on inmates. About 32,000 died in Dachau. Then even after the war, Nazi officials arrested were held there. Infamous entrance gate made of iron with the slogan Arbeit macht frei (work makes you free). Inside were buildings for processing prisoners, the bunker, the barracks, the crematorium, etc. They turned the camp maintenance building into a museum organized chronologically. We listened to our audioguides at the different exhibits learning about prisoner life, their work, their food, diseases and the ware related medical experiments of human tolerance. There is a short documentary they show inside the museum building every hour so we made sure to catch that as well. We walked through barracks that were recreated to give an idea of sleeping and living conditions. There were 34 barracks, each 10 yards by 100 yards. Down this long road is where the furnace was. In the winter of 1944-1945 there was not enough coal to burn all the bodies so they dug these giant graves outside the campsite and put people in those instead. We would have walked down to it but at this point it started raining pretty hard and was very windy. I am sure it would be so strange to currently live in a town that had a concentration camp but most of those living there even while it was active didn't really know what was going on. They thought the prisoners were just being put to work. You may find it strange we wanted to go to a concentration camp but I think it is an important part of history and shouldn't be forgotten. Being able to see it firsthand is so different than reading about it or even watching videos. 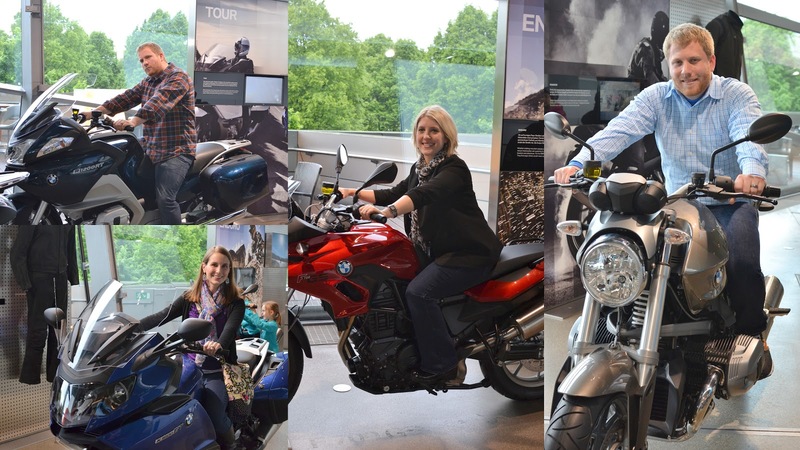 Since after doing Dachau you need something to lift your spirits we decided on the BMW complex since it was still rainy outside. We took the the bus again back to the subway and then a couple of subway lines to get there.. Europe public transportation really is great. In Germany it's pronounced bay-em-vay because all W's are pronounced like V's. We had late lunch in a little cafe inside. It was pretty basic foods like hotdogs, soup and sandwiches. I actually had a great pesto tomato mozzarella panini. There are cheap lockers downstairs to put your stuff if you don't feel like walking around with it so we stowed our rain jackets there. At the BMW-Welt (which is free) we wandered around the exhibits and looked at all the cars and sat in them. We could also see and read about some of the new technologies and products that BMW is working on.... like leather seats that don't get hot from sun exposure. And we can't forget the motorcycles. Across the road is the museum in a cool round building but we did not end up going to that. 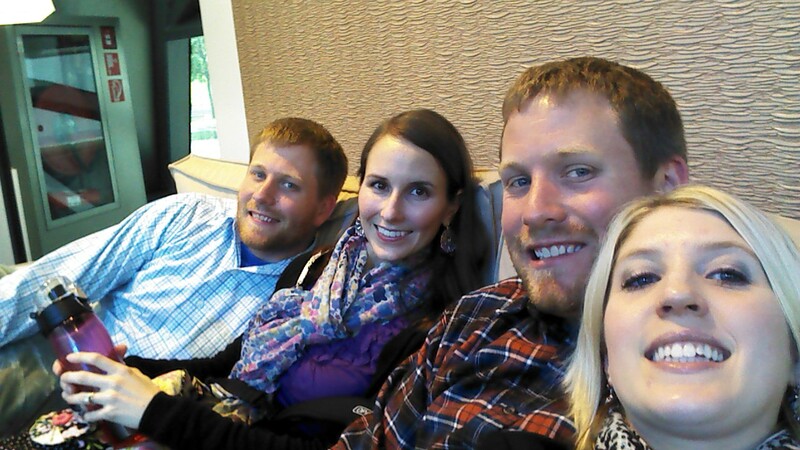 We did sit down for a few minutes to regroup. After that, we decided to find a dessert place to take home dessert for later. We found a cupcake place a few doors down from where we had dinner the night before. We each picked out a cupcake from the tiny shop. The lady spoke pretty good English but at one point she said "you going from far" while gesturing at a covered take out box and a plastic bag. Megan immediately replied with "we're from America!" The lady looked at her a little puzzled and Keith recovered with "yes we'd like a box". I'm not even sure how he kept a straight face because it was all we could do to get out of the store before bursting into laughter. That evening Megan and I had a girls night in while the boys went to the Hofbrauhaus. We aren't really beer drinkers or into traditional German fare so this worked out perfect. We had wine and we made spaghetti with zucchini. Our biggest challenge was having no olive oil or spices to cook the zucchini... it definitely wasn't the best I've ever made. We figured the apartment would have those few cooking basics but it did not (although strangely it did have flour). After the usual photo taking we decided to eat our cupcakes and discovered they were not good at all. Although very pretty, they were dry and just did not taste very good. I think I ate some grocery store shortbread cookies we had bought instead. The boys returned from their dinner. They had a good time drinking and eating at the Hofbrauhaus even though they said it was a bit touristy. They were glad that everyone there spoke great English so there was no trouble ordering. Here are the photos they managed to take with their phones while there. Next up is our Crazy King Ludwig Castle tour day!